Reprinted with permission from the November 10, 2014 edition of the New York Law Journal ©2014 ALM Media Properties, LLC. All rights reserved. Further duplication without permission is prohibited. For information, contact 877-257-3382 – reprints@alm.com or visit www.almreprints.com. 1. Matter of Chin, 118. A.D.3d 61 (1st Dept. 2014). 2. The supreme court shall have power and control over attorneys and counsellors-at-law and all persons practicing or assuming to practice law, and the appellate division of the supreme court in each department is authorized to censure, suspend from practice or remove from office any attorney and counsellor-at-law admitted to practice who is guilty of professional misconduct, malpractice, fraud, deceit, crime or misdemeanor, or any conduct prejudicial to the administration of justice; and the appellate division of the supreme court is hereby authorized to revoke such admission for any misrepresentation or suppression of any information in connection with the application for admission to practice. 5. Noncompliance by an attorney with the provisions of this section and the rules promulgated hereunder shall constitute conduct prejudicial to the administration of justice and shall be referred to the appropriate appellate division of the supreme court for disciplinary action. (a) Attorney obligations. Each attorney subject to New York’s continuing legal education requirements shall retain the certificate of attendance or other documentation required by the board for each approved education course, program or activity for at least four years from the date of the course, program or activity. (b) Certification. Except as otherwise authorized by this Part, each attorney subject to New York’s continuing legal education requirements is required to certify along with the submission of his or her biennial attorney registration statement that the attorney has satisfactorily completed 24 credit hours of continuing legal education for the current biennial reporting cycle and that the attorney has retained the certificates of attendance or other documentation required by the CLE board for the accredited courses, programs or activities. 4. Matter of Jones, 118 A.D.3d 41 (2d Dept. 2014). 5. Matter of Jones, 118 A.D.3d at 42-46. 6. Matter of Ehrenfeld, 992 N.Y.S.2d 569 (2d Dept. 2014). 7. See, e.g., Matter of Dobkin, 21 A.D.3d 23 (2d Dept. 2005) (five-year suspension for not preserving escrow funds in two real estate transactions, notwithstanding that no client suffered financially). 8. Matter of Ehrenfeld, 992 N.Y.S.2d at 570. 9. Matter of Dunn, 111 A.D.3d 1019 (3d Dept. 2013). 10. Matter of Dunn, 22 N.Y.3d 861 (2014). 11. However, “collateral estoppel” as a general concept is broadly applied in other attorney disciplinary contexts, namely, where a lawyer is convicted of a crime [see 22 NYCRR §603.12 (1st Dept. ); 22 NYCRR §691.7 (2d Dept. ); 22 NYCRR § 806.7 (3d Dept. ); 22 NYCRR §1022.21 (4th Dept.)] or has engaged in parallel misconduct in a foreign jurisdiction, i.e., reciprocal discipline [see 22 NYCRR §603.3 (1st Dept. ); 22 NYCRR §691.3 (2d Dept. ); 22 NYCRR §806.19 (3d Dept. ); 22 NYCRR §1022.22 (4th Dept.)]. Collateral estoppel in the attorney disciplinary context with respect to prior civil adjudications has evolved in three of the four Departments, to varying degrees, as a result of case law. See, e.g., Matter of Slater, 156 A.D.2d 89 (1st Dept. 1990); Matter of Ryan, 189 A.D.2d 96 (1st Dept. 1993); Matter of Klarer, 66 A.D.3d 247 (2d Dept. 2009); Matter of Duffy, 117 A.D.3d 124 (2d Dept. 2014); Matter of Babigian, 247 A.D.2d 189 (3d Dept. 1998); Matter of Capoccia, 32 A.D.3d 189 (3d Dept. 2000). How Do I Get Back My Law License? 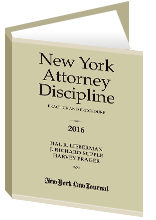 Reprinted with permission from the November 29, 2013 edition of the New York Law Journal ©2013 ALM Media Properties, LLC. All rights reserved. Further duplication without permission is prohibited. For information, contact 877-257-3382 – reprints@alm.com or visit www.almreprints.com. Readers of this column should not infer that there are no disciplinary consequences for failure to reregister. Noncompliance with the attorney registration provisions may exacerbate difficulties for an attorney under investigation by a disciplinary authority for other matters, particularly where violation of the registration rules makes it harder for a disciplinary committee to locate and communicate with the attorney. See Matter of Anyikwa, 109 A.D.3d 76 (1st Dept. 2013) (suspending attorney in part due to failure to comply with Judiciary Law §468-a(2)); Matter of Banji, 106 A.D.3d 73 (1st Dept. 2013) (suspending attorney and noting that his failure to register for the biennial period and failure to notify OCA of changes to his addresses and telephone numbers is prejudicial to the administration of justice). See 22 N.Y.C.R.R. §§603.14(a)(1) (First Department); 1022.28(b)(2) (Fourth Department). See N.Y. Judiciary Law §90(5)(b). The First, Second, and Fourth departments require petitioners to use application forms specifically provided in the rules. See 22 N.Y.C.R.R. §§603.14(m) (First Department); 691.11(b) (Second Department); 1022.28(a)(3) and (b)(3) (Fourth Department).